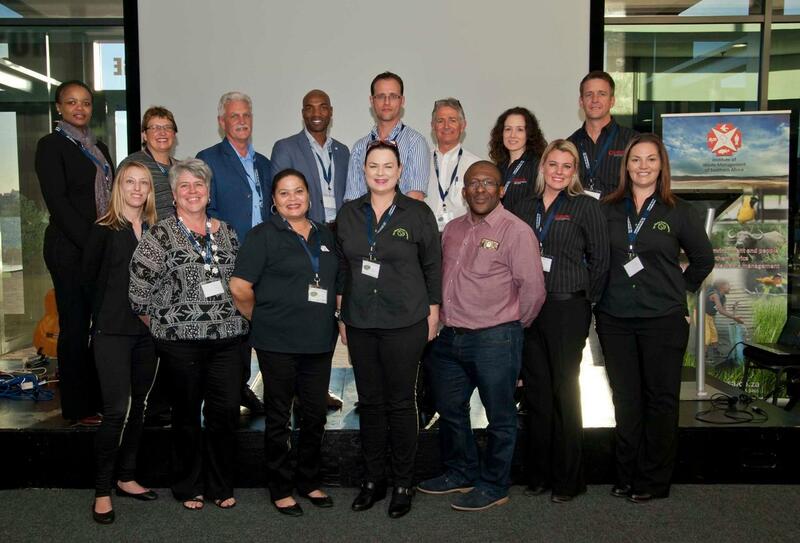 02 August 2017 – The Institute of Waste Management of Southern Africa’s Eastern Cape branch hosted the Green Is The New Gold conference in the splendid World of Windows venue at the Nelson Mandela Bay Stadium. The conference theme was based on the principle of changing perceptions in terms of considering waste as a valuable resource, “we also recognized that our theme mirrors that of the Springbok team, who are hosting a game later this month,” said Theo von Ruben, Chairperson of the IWMSA EC branch. The conference hosted nine speakers from diverse backgrounds and offered various forms of entertainment for the delegates. First to approach the microphone was Rosa Blaauw from the Nelson Mandela Bay Municipality, who presented the NMB Stadium’s Environmental Management System and elaborated on the various green initiatives of the stadium, “The establishment of a Recycling buy-back facility at the stadium is one of the key focus areas for the near future, and this will directly benefit the immediate community by creating a value chain for recyclable material,” she reported. Walter Fyvie, Senior Associate from the Environmental unit of GIBB, presented the third paper, which discussed the Nelson Mandela Bay Municipality Waste Drop-Off Facility Master Plan. “Illegal dumping is a pressing concern, annually 85 994 tonnes of illegally dumped waste is removed in the NMBM,” Walter further highlighted the need for recycling drop off facilities such as the upgraded Kragga Kamma waste transfer station and he presented the systematic planning process that was used to determine where future drop-off facilities should be located. Kabega Primary, Nelson Mandela Bay’s top recycling school, ended with a motivational presentation about the school’s various greening efforts. Dr Adele Botha explained how Kabega Primary started recycling with Project Groenspoor and The Waste Trade Company and the many lessons they have learnt on their journey to success, “a schools recycling project needs green champions to drive the project, it is an absolute team effort that needs support from all of the school’s stakeholders - the principal, teachers, parents, learners and private partners are all key role players.” She continued to discuss how Kabega Primary has raised funds through recycling and invested in other projects such as green gardening, water saving and solar power. Following the informative presentations, delegates were treated to a live performance by Emmy Nxayeka, Schools Project Coordinator, The Waste Trade Company who launched a Recycle Rap. Emmy was accompanied by learners from Kabega Primary and Molefe Primary. During the event delegates were awarded lucky draw prizes from various sponsors, presented by Miss Earth SA finalist Lauren Giani, enjoyed beer tasting from Bridge Street Brewery and were entertained with live music by the Mad Hatters. Interwaste, Kabega Primary, Greencycle, Oricol, The Waste Trade Company, Chemsolved, Noziqhamo Arts and Crafts, EnviroServ, Vic’s Garden Furniture, Timber Solutions and Karoo Kwezi offered exhibitions where delegates had the opportunity to explore solutions to their specific waste needs. In closing, Southern Kings rugby player, Siyanda Grey, modeled a Springbok Rugby shirt that was auctioned off to delegates, “we would like to thank all parties that played a role in the successful running of the conference, events such as these really showcase the vision and mission of the IWMSA, which includes fostering communication between all stakeholders in the waste industry and promoting the value of waste as a resource,” Theo von Ruben, Chairperson of the IWMSA Eastern Cape Branch.